René Mancini was an Italian born shoe designer and he opened a boutique in Paris, France in 1936. The discovery of Mancini actually happened rather strangely. The mother of Haute Couture designer, Pierre Balmain, was the first to recognize Mancini's talent and recommended her son Pierre to begin working with the Italian shoe designer. Pierre Balmain would design the couture collection with René Mancini. Mancini's designs were a perfect complement for La Maison de Balmain. Soon other couture houses such as Givenchy, Balenciaga and Coco Chanel all sought the quality of Mancini's creativity and design expertise. ​Coco Chanel and René Mancini. I remember that somebody once told me that the first Chanel bicolor sandals were made by René Mancini and not Raymond Massaro, or his father, whatever he used to claim. But it's only when I began to attend Michel Boudoux's tuition of shoe making that I got the chance to see and take photos of them. Michel has been working for twenty years with René Mancini, before he opened his own house that he ran for another twenty years avenue Montaigne, opposite of the Plaza. Coco Chanel re-opened her house in 1954 and when she needed someone to make the shoes she got in mind she went to see Mancini. Michel remembered pretty well the meetings with Mademoiselle. In fact during the three years collaboration between Mancini and Chanel (they also made all of her personal shoes), it was him who dealt with her and it's no secret that she wasn't easy to work with but she knew exactly what she wanted, she got a sharp eye and an amazing taste and knowledge of what would work or not. And this sandal was a total success. The Metropolitan Museum of Art Features René Mancini Creations. Jackie O's Shoes Fetch Nearly $30,000 at Auction. A pair of shoes belonging to Jacqueline Kennedy Onassis, made by Parisian designer Rene Mancini, sold yesterday for $29,478 at Nate D. Sanders Auction. The size-10 black leather court shoes — a style the former first lady preferred — feature a bow detail near the toe box, and belonged to James H. Boyer, Sr., a U.S. Capitol Police Officer and former Kennedy chauffeur. 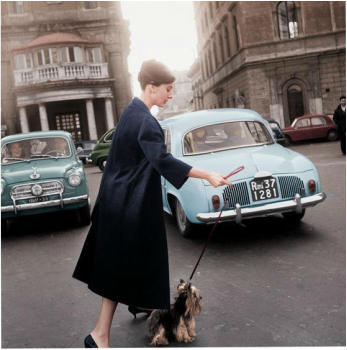 ​Audrey Hepburn walking her dog in Rome and wearing Mancini shoes. Vanity Fair featured Audrey Hepburn's love of Haute Couture. Her son Luca's memoirs detailed Mme. Hepburn's fashion love for Rene Mancini. We are very honored and humbled. “She didn’t live a life secluded or behind bars; she would walk around and everybody knew her. She was part of the city. The majority of these photos are in the streets,” Audrey Hepburn’s son Luca Dotti tells Vanity Fair’s Laura Jacobs about the time his mother spent in Rome.